A few days ago I posted a note about our air conditioner and that it seems the newer things weren't built. One of my blog buddies termed it "Planned obsolesce." I thought to myself, that's a perfect description to some of the things manufactured today. On the other hand, some things were built to last. For example, the old Ford Tractor pictured below belonged to my father-in-law. He bought it in the early 80s. Even then it was an antique. The old workhorse was built just after World War II in 1949. With a fresh battery, a tank of gas, a little air in the tires, and a squirt of starter fluid in the carburetor, to have this baby fired up and ready to roll. It doesn't have all the new fangled gadgets that today's tractors have, but it has a bush hog, a cultivator, and a turning plow. Our nephew leaves his tractor parked in our barn so I haven't had to use the old tractor in years, but today as I walked, I saw it sitting patiently in the barn awaiting my call to duty. What would the world be like today, it things were built to last? I love that photo! It belongs on a wall in a photography exhibit. One picture worth a thousand memories. I think you should fire up the old tractor every now and then just because. Sadly people fall into the planned obscelence category too. Younger models are much preferred and the old ignored. I have found this to be so true...older things were built to last longer. It's a disposable society today. When I downsized one of things that went was a stove over 50 years old which still worked just fine! Great picture ! Machines made then could be repaired with a bit of baling wire and a pair of pliers. You know; the good old days. I love this photo! Sad, how ours has become a disposable society - focused on newer, better, best. (Thank you, NOT, Madison Avenue.) Recently, Tom and I were compelled to trade in our old cell phones; and already, he's feeling buyer's remorse. If things were only built to last? 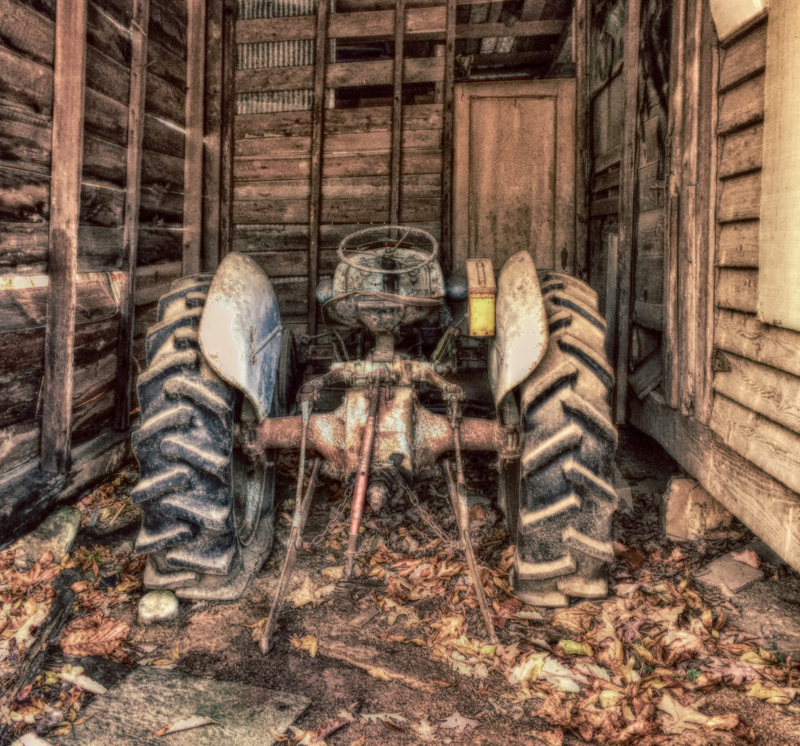 We live in a throw away society where everything it seems is built to be replaced, I would love to see things built like the tractor you have pictured, with only the options you need and none of the new fangled gadgets. Dear Rick, it's so good to read your common-sense posting. You always seemed--in the past when I was regularly posting and reading blogs--to have a built-in sensor for that which is valid and sure. Like you, I often find that items made in the past were built to last. And now, as I'm aging--81 now--I'm hoping that I'm built to last quite a bit longer too! Peace to you now and always. I bought my first tractor in the 80's. It was an 8N Ford '48-49. It is still running at a nephew's house. I bought a new 'Yanmar' tractor in the 90's and within 5 years it needed work, the 8N still runs. I just started the Yanmar this week, it needs hydraulic work. OUCH. Like Dee I hope I am made to last (At least a little longer without major repairs or the junk yard. Properly taken care of this old treasure will probably run another 75 years. Wow, that an oldie... New electronic tractors are even more complicated than car and cost as much as a house to buy and are always in need of repairs that can't be done without a manufacture licence mechanic with sensor reader gadgets that cost a lot of money. Most of the farm equipments we use on our farm uses some kind of electronic gadgets and do some complicated jobs and are very powerful. We can get so much work done at a fraction of the time it used to take and with less labor but there a price to be paid. When they break down we need a professional to fix it. My husband used to service David Brown tractors when they were ordinary tractors but can no longer service the very big tractors he uses now.